The blue whale is the largest animal in the history of the earth! It’s heart is the size of a Volkswagen bug and the main aorta leaving the heart is large enough for a young child to crawl through. Most people don’t know that the Blue Whale primarily eats one of the smallest animals in the ocean – shrimp-like creatures called krill. They can’t swallow large prey because their throat is only 8 inches in diameter! Blue whales in the southern ocean can be over 100 feet long and weigh well over 150 tons. Here along the California coast, blue whales get to be up to 85 feet long. They are best identified by their tall, straight spouts (that can be up to 35 feet tall and hang in the air for much longer than other whale spouts) and their bluish-gray mottled skin. The other distinctive characteristic of the blue whale is a very long, streamlined body allowing relatively fast swimming speeds. When you see the spout and the whale is rolling at the surface, you will see a long back followed by a very small dorsal fin. Most other whales show the dorsal fin almost immediately after the spout. 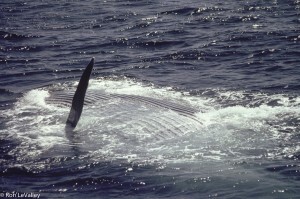 Blue whales will only occasionally raise their tail flukes at the end of a dive. Blue whales are identified by their flukes and small dorsal fin, and individuals are identified by the patterns of color on their backs. 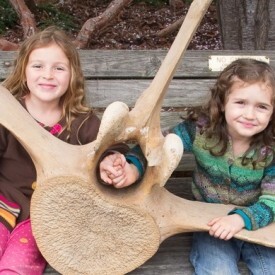 Blue whales have smooth skin with few or no barnacles. Rarely you might see a remora (a type of fish with a sucker on its head) or what we think is a small parasitic crustacean in the genus Pennella that looks like a tiny eel hanging off the dorsal fin or the tail flukes. 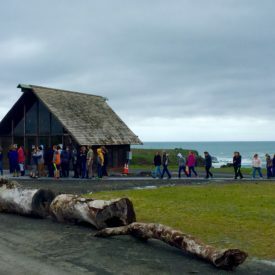 Our blue whales along the Mendocino Coast are here from around June through October. 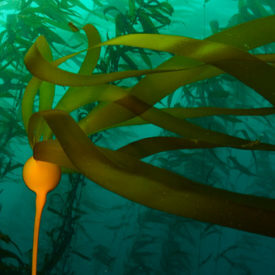 During the winter they spend time in Baja California, off the coast of Mexico and as far south as Panama and Costa Rica. In these warmer waters the whales mate and about one year later females give birth. Females have calves about every 2-3 years and nurse them for about 7 months. When the blue whale calves are born they weigh about 6 tons and during the 7 months of nursing they will consume about 100 gallons of rich milk a day and gain as much as 8 pounds per hour! When they are weaned they will be over 50 feet long – the size of a humpback whale! 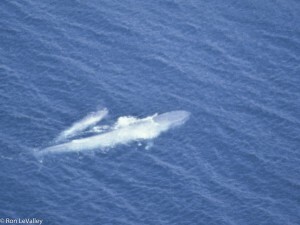 After spending time in the warmer waters, the blue whales begin their northerly migration in late spring. Their migration pattern is not well known, but it appears they travel north until they find their favorite food – krill. Then they will stop and eat. If they find lots of krill, they might not migrate very far north. If they can’t find the krill then there is evidence that they can migrate up to the Gulf of Alaska looking for food. Blue Whales feed primarily on krill but are known to eat other crustaceans such as copepods and pelagic crabs and at times schooling fish. The blue whale has a truly global distribution, occurring in the Arctic Sea, Atlantic Ocean, Indian Ocean, and Pacific Ocean. In spite of their global distribution, they are one of the rarest of the whales, and most biologists consider them to be among the most endangered of the great whales. Only the eastern North Pacific off California is showing signs of real recovery, but our population still only includes about 2,000 animals currently. 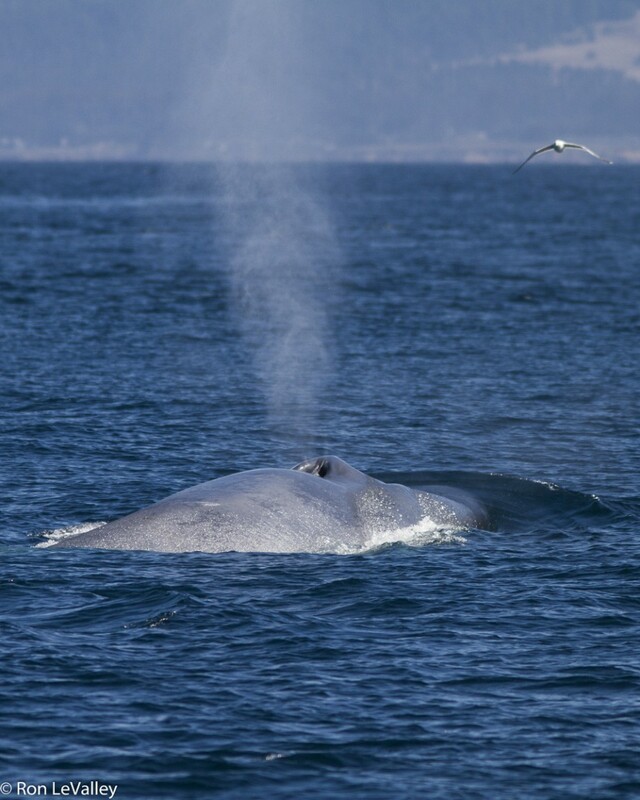 When blue whales are off of our coast, they tend to stay out along the continental shelf, 8-15 miles offshore, but they are occasionally seen from land – so if you are here in the summer or early fall and the ocean is calm, keep your eyes out for that tall spout!